Businesses are transforming how they use data. By using a mobile forms app, paperwork such as timesheets, inspection logs, and surveys can be completed digitally and automatically integrated into your existing data systems. These automated workflows result in fast access to field data and lowered operational cost. Device Magic and GoCanvas are two major providers of mobile forms software. While the platforms have many similarities, there are key differences between the two providers. 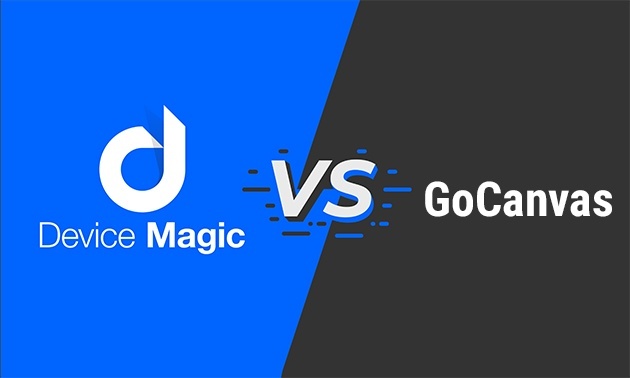 To help you choose the best mobile forms provider for your business, let’s compare the features, integrations, and cost of Device Magic and GoCanvas. Both Device Magic and GoCanvas offer a strong set of features. They each offer a drag and drop form builder, customizable PDF data delivery, offline access, automated workflows, form dispatch, single sign-on (SSO), reporting analytics, and more. When purchasing a digital forms solution, keep in mind that on both platforms, not all features are available for all plans. Another difference is that Device Magic is the only service that offers a web app so you have the flexibility to use a desktop, laptop, or mobile browser to submit forms. A key aspect of mobile forms, software integrations create a way for your data to seamlessly integrate with your other information systems. With the right integrations, the mobile forms software will do the heavy lifting of data integration for you. Both Device Magic and GoCanvas offer built-in integrations that streamline the process of software communication without needing coding. GoCanvas’ Business, Professional, and Enterprise plans offer a set of standard integrations including Box, Dropbox, Email, Evernote, Google Drive, Salesforce, and Zapier. Comparatively, Device Magic offers several more pre-built integrations. In addition to the integrations mentioned above, Device Magic integrates with Slack, SMS, Podio, HTTP(S), SFTP, Geotab, and ShareFile. Through Zapier, Device Magic users can integrate with Zoho, Wufoo, Constant Contact, SugarCRM, Project Manager, and more. Custom integrations using JSON are available for Advanced and Enterprise users. Additionally, Enterprise users can create custom integrations via XML or the API. Both Device Magic and GoCanvas let you export data to a CSV or spreadsheet. Cost is a major factor for any software decision, and comparing these two mobile forms providers reveals that Device Magic has much lower rates. Both companies offer a free plan that has limited functionality. For businesses, the monthly rate for Device Magic’s Standard plan is $25 per device when paid annually. GoCanvas’ Business plan costs 80 percent more at $45 per user when paid annually. To access more features, monthly costs for Device Magic’s Advanced plan are $34 per device when paid annually. GoCanvas’ monthly rates are 62 percent higher at $55 per user when paid annually. Both companies also have month-to-month rates available for businesses that would rather not have the upfront cost. Device Magic’s month-to-month rates are $30 for the Standard plan and $40 for the Advanced plan. Once again, GoCanvas is more expensive, with rates that are 55 to 70 percent higher. Both Device Magic and GoCanvas mobile forms platforms have a rich set of features. The costs of GoCanvas’ plans are significantly higher than those of Device Magic; businesses could see rates that are 55 to 80 percent higher, in fact. This extra cost can add up quickly. For example, a business with 20 devices on the standard Device Magic plan would save $4,800 over a year when compared to 20 users on GoCanvas’ Business plan. Additionally, Device Magic offers more built-in integration options, providing more ways for your business to seamlessly integrate information to your CRM, project management software, and communications app. That means that, with Device Magic, you pay less and get more.